We're adding to our selection of Cuddly Quilt Kits, with all new easy quilt patterns for baby and young children. You'll find them in the Quilt Kits section of the store. We have 2 quilt designs to share with you today. These baby quilt kits include all the fabric you need to complete the quilting project. Each kit includes a coordinated collection of baby and kid themed fabrics, including premium cotton, soft flannel, and textured plush. The Fun in the Sun Cuddly Quilt Kit is a bright collection of fabrics, featuring yellow ducks out for swim. The textured yellow plush material is ultra soft to the touch. Each Cuddly Quilt Kit includes step-by-step instructions. The finished size of the quilt will be 30" x 36". To ensure adequate amount material to complete your quilt, do not pre-wash the fabrics in this kit. When ironing the plush fabrics, it's important to use a pressing cloth. This will protect your iron as well as the textured fabric from being damaged. The finished quilt care instructions recommend to machine wash cold and lay flat to dry. 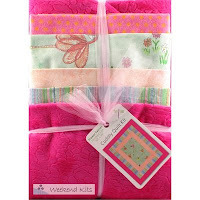 The Flower Fairies Cuddly Quilt Kit is a beautiful collection of solid, striped, and polka dot fabrics. The dancing flower fairies are featured in the center of the quilt. The textured magenta plush material creates an ultra soft border. The simple pieced design makes these quilt kits ideal for beginners. The small size and convenience of coordinated fabrics, makes this a quick weekend quilt project for experienced quilters. Visit the Quilt Kits section to see our complete selection of baby quilt kits. You'll need to have some basic quilting supplies on hand to complete your baby quilt project, including scissors, quilting pins, seam ripper, sewing machine, and thread. 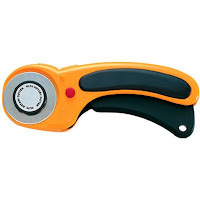 A rotary cutter, cutting mat, and quilt ruler will make cutting your fabrics a breeze! Visit the Quilting Supplies section of the store to see our selection of supplies for quilt making. The instructions for finishing the Cuddly Quilt Kit do not include adding a batting layer or steps for binding. You may prefer to finish your quilt using more traditional methods, including batting and binding. I believe that adding a batting layer will give your finished quilt more warmth and depth, so I recommend this added step. About.com's How to Make a Quilt page is a helpful quilting resource for beginners, with tutorials and helpful tips for making a quilt from start to finish. Bookmark it to use as a ready reference. Explore a creative selection of easy quilt kits at Weekend Kits and be ready to start quilting on your next Weekend at Home! Beginner Craft Kits Make Learning Easy & Fun!